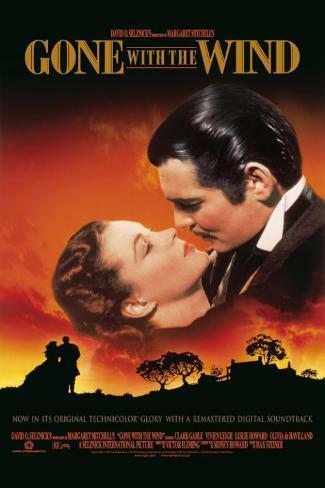 Gone with the Wind – This was the first time I’d seen this film, which was released in the same year as The Wizard of Oz, by the same studio with the same director. It’s definitely a well-made movie, and doesn’t particularly drag despite its really long running time. It also has some really problematic elements. It paints a picture of the antebellum South as idyllic, largely glossing over how this was really only true for rich people who lived a life of leisure while making people they owned do all the work. That the slave owners we see are generally polite to their slaves and allow them some degree of autonomy is somehow supposed to make up for the fact that they’re SLAVES. This is a fairly minor part of the story, with slavery seemingly there just to add verisimilitude rather than because the enslaved people are actual characters. I’d say it didn’t age well, but this was really controversial even when the movie came out. What’s questionable is how much the filmmakers were actually espousing this view, especially considering that we see most of it through the eyes of a rather self-centered character. I know Margaret Mitchell, who wrote the novel on which it was based, complained about the exaggerated opulence of the house at Tara. She also made a point that Scarlett’s father did not start out rich, but won his land in a poker game and developed it into a profitable plantation. I’m sure it helped that he didn’t have to pay his workers, though. I’ve also seen indications that the racism was downplayed in the movie, which, among other things, glossed over a fairly positive portrayal of the Ku Klux Klan by Mitchell. Hattie McDaniel won an Oscar for Best Supporting Actress for playing Mammy (which isn’t really a name), but was made to read a speech that included a line about being a credit to her race. She did say she’d much rather make good money playing a maid than actually being one, though. Scarlett O’Hara, the heroine of the film, is a somewhat ambivalent character. I found her generally unlikable, although I can kind of understand how she came to be that way, and she was portrayed as resilient and shrewd. We first see her as someone who flirts with a lot of men, and carries a torch for one particular guy even after he marries his cousin Melanie. It’s not entirely clear why she wants this guy so much, as he seems pretty uninteresting. I think she largely just wants what she can’t have. The IMDB mentions that her unrequited love interest isn’t especially masculine, which makes it kind of amusing that the character is named Ashley and he’s played by an actor named Leslie, both of which were more commonly male names until the middle of the twentieth century but are now generally regarded as female, at least in my own experience. Leslie Howard was apparently really a more rugged type who hated the role, at least from what I’ve read. Scarlett marries Melanie’s brother before he goes off to war despite not really having feelings for him, and after he dies, she and Melanie become closer. I couldn’t help thinking that it might have been more satisfying if Scarlett and Melanie had become lovers, but this isn’t that kind of story. Rhett Butler, who admires Scarlett for her stubbornness, continues to show up in her life and sort of welcome his advances but ultimately shrug them off. After the war and General Sherman’s destruction of much of the land, she restores the plantation and does labor to get it functioning again. She marries an older man for his money, and finally gets together with Rhett after he dies. He remains frustrated at her obsession with Ashley, however. At one point, he rapes her while drunk, and she seems really happy about it afterwards. I get that they’re trying to show the relationship is founded on their mutual contrariness, but that’s still not cool. Overall, Rhett is played as a lovable rogue, sort of a Han Solo type, although of course he predates Han by a long time. Towards the end, Melanie dies and Rhett leaves Scarlett, who vows to get him back. See what I mean about wanting what she can’t have? This entry was posted in American Civil War, History, Names, Prejudice, Relationships, VoVat Goes to the Movies and tagged ashley wilkes, clark gable, general william tecumseh sherman, gone with the wind, hattie mcdaniel, leslie howard, lost cause, margaret mitchell, melanie wilkes, olivia de havilland, plantations, racism, rhett butler, scarlett o'hara, slavery, vivien leigh. Bookmark the permalink. I blind bought the last anniversary reissue in 2014. I had of course heard “Frankly my dear, I don’t give a damn,” and knew that Victor Fleming directed it, but all I thought it was was a love story in the old South. In addition to the racism (a big point for me is when Scarlett slaps one of the slaves), I thought Rhett was especially abusive to Scarlett. And heck, he lets their kid die in front of them! I think it normalizes a certain level of abuse, which is probably accurate to the time period, but still something that makes the characters less sympathetic. Like, I get that Scarlett and Rhett are supposed to both be stubborn, but there’s still a power dynamic at work there. I’ve only seen Gone With the Wind once in my life. I watched it on the big screen a number of years ago… obviously, not when it was originally out, though I did briefly speak to an old guy during intermission who had first seen it in 39. I remember immediately being a little put off by the romanticized portrayal of the antebellum south. But afterward I reasoned that perhaps the movie’s seeming attempt to make the fall of the south seem like a tragedy was somehow linked to its efforts to garner sympathy for a fairly unlikable protagonist. My opinion of Margaret Mitchell softened only recently when I learned from a special on PBS that I only caught the end of that she’d anonymously helped put several African Americans through medical school. My sister read the book when we were kids. I told her everybody died in the end, because, for some reason, I thought that’s what happened, and she got annoyed because she believed me. From that point on, it became something of a running joke for me to tell her that everybody died in the end of whatever book she was reading.